The actress plays Scarlet Witch in Avengers: Infinity War. 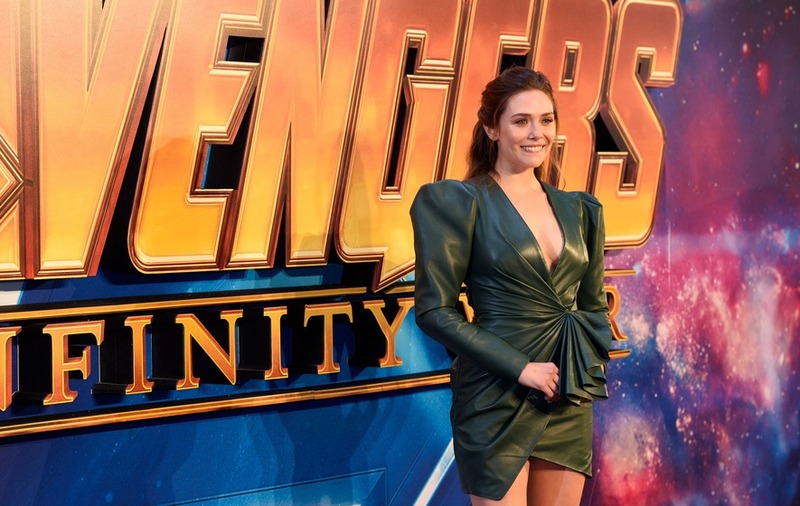 Elizabeth Olsen made sure all eyes were on her as she arrived at an Avengers fan event in a green leather dress with a plunging neckline. The head-turning outfit also featured puffed 80s-style sleeves, a tightly gathered waist and a short, uneven skirt. Olsen, 29, teamed the frock with simple black stiletto heels and wore her brunette hair with the front swept back. The actress plays Scarlet Witch in Avengers: Infinity War, the latest instalment in the Marvel cinematic universe. She joined co-stars including Tom Hiddleston, Benedict Cumberbatch and Letitia Wright at a fan event to celebrate the movie in London. Cumberbatch, who plays Stephen Strange in the films, was joined by his wife Sophie Hunter. The pair looked happy and relaxed as they enjoyed a night off from parenting their two young sons. Actor Tom Holland posed for pictures on the purple carpet with a fan dressed as his Marvel alter-ego, Spider-Man. The new film is set two years after the events of Captain America: Civil War and will see the return of cast members including Robert Downey Jr and Chris Hemsworth. It is due to be released in the UK later this month.